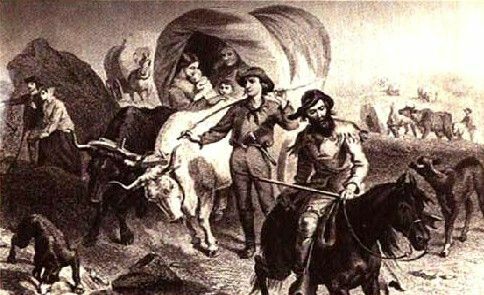 On April 16, 1846, nine covered wagons left Springfield, Illinois on the 2500 mile journey to California, in what would become one of the greatest tragedies in the history of westward migration. The originator of this group was a man named James Frasier Reed, an Illinois business man, eager to build a greater fortune in the rich land of California. Reed also hoped that his wife, Margaret, who suffered from terrible headaches, might improve in the coastal climate. Reed had recently read the book The Emigrants’ Guide to Oregon and California, by Landsford W. Hastings, who advertised a new shortcut across the Great Basin. This new route enticed travelers by advertising that it would save the pioneers 350-400 miles on easy terrain. 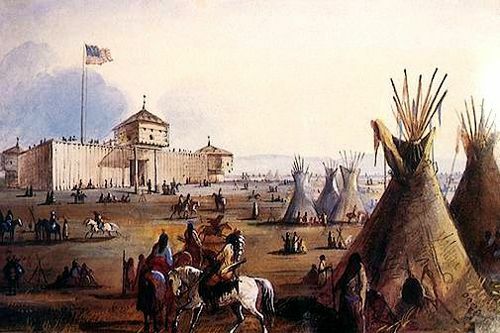 However, what was not known by Reed was that the Hastings Route had never been tested, written by Hastings who had visions of building an empire at Sutter’s Fort (now Sacramento.) It was this falsified information that would lead to the doom of the Donner Party. Reed soon found others seeking adventure and fortune in the vast West, including the Donner family, Graves, Breens, Murphys, Eddys, McCutcheons, Kesebergs, and the Wolfingers, as well as seven teamsters and a number of bachelors. The initial group included 32 men, women and children. In nine brand new wagons, the group estimated the trip would take four months to cross the plains, deserts, mountain ranges and rivers in their quest for California. Their first destination was Independence, Missouri, the main jumping-off point for the Oregon and California Trails. Also in the group were the families of George and Jacob Donner. George Donner was a successful 62-year-old farmer who had migrated five times before settling in Springfield, Illinois along with his brother Jacob. Obviously adventurous, the brothers decided to make one last trip to California, which unfortunately would be their last. With George were his third wife, Tamzene, their three children, Frances, Georgia, and Eliza, and George’s two daughters from a previous marriage, Elitha and Leanna. Jacob Donner, and his wife Elizabeth, brought their five children, George, Mary, Isaac, Samuel and Lewis, as well as Mrs. Donner’s two children from a previous marriage, Solomon and William Hook. Also along with them were two teamsters, Noah James and Samuel Shoemaker, as well as friend named John Denton. In the bottom of Jacob Donner’s saddlebag was a copy ofLansford Hastings’s Emigrant’s Guide, with its tantalizing talk of a faster route to the garden of the earth. Ironically, on the very day that the Illinois party headed west from Springfield, Lansford Hastings prepared to head east from California, to see what the shortcut he had written about was really like. The wagon train reached Independence, Missouri about three weeks later, where they re-supplied. The next day, on May 12, 1846, they headed west again in the middle of a thunderstorm. A week later they joined a large wagon train captained by Colonel William H. Russell that was camped on Indian Creek about 100 miles west of Independence. Along the entire journey, others would join the group until its size numbered 87. On May 25th the train was held for several days by high water at the Big Blue River near present-day Marysville, Kansas. It was here that the train would experience its first death, when Sarah Keyes died and was buried next to the river. After building ferries to cross the water, the party was on their way again, following the Platte River for the next month. Along the way, William Russell resigned as the captain of the wagon train and the position was assumed by a man named William M. Boggs. 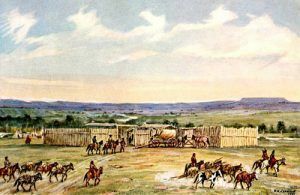 Encountering few problems along the trail, the pioneers reached Fort Laramie just one week behind schedule on June 27, 1846. At Fort Laramie James Reed ran into an old friend from Illinois by the name of James Clyman, who had just traveled the new route eastwardly with Lansford Hastings. Clyman advised Reed not to take the Hastings Route, stating that the road was barely passable on foot and would be impossible with wagons; also warning him of the great desert and the Sierra Nevadas. Though he strongly suggested that the party take the regular wagon trail rather than this new false route, Reed would later ignore his warning in an attempt to reach their destination more quickly. The letter successfully allayed any fears that the party might have had regarding the Hastings cutoff. On July 19th the wagon train arrived at the Little Sandy River in present-dayWyoming, where the trail parted into two routes – the northerly known route and the untested Hastings Cutoff. Here, the train split, with the majority of the large caravan taking the safer route. The group preferring the Hastings route elected George Donner as their captain and soon began the southerly route, reaching Fort Bridger on July 28th. 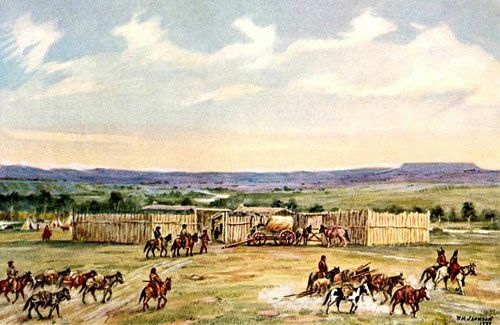 However, upon their arrival at Fort Bridger, of Lansford Hastings, there was no sign, only a note left with other emigrants resting at the fort. The note indicated that Hastings had left with another group and that later travelers should follow and catch up. Jim Bridger and his partner Louis Vasquez assured the Donner Party that the Hastings Cutoff was a good route. Satisfied, the emigrants rested for a few days at the fort, making repairs to their wagons and preparing for the rest of what they thought would be a seven week journey. On July 31st, the party left Fort Bridger, joined by the McCutchen family. The group now numbered 74 people in twenty wagons and for the first week made good progress at 10-12 miles per day. On August 6, the party reached the Weber River after having passed through Echo Canyon. Here they came to a halt when they found a note from Hastings advising them not to follow him down Weber Canyon as it was virtually impassible, but rather to take another trail through the Salt Basin. While the party camped near modern day Henefer, Utah, James Reed, along with two other men forged ahead on horses to catch up with Hastings. Finding the party at the south shore of the Great Salt Lake, Hastings accompanied Reed part way back to point out the new route, which he said would take them about one week to travel. In the meantime, the Graves family caught up with the Donner Party, which now numbered 87 people in 23 wagons. Taking a vote among the party members, the group decided to try the new trail rather than backtracking to Fort Bridger. On August 11th, the wagon train began the arduous journey through the Wasatch Mountains, clearing trees and other obstructions along the new path of their journey. In the beginning, the wagon train was lucky to make even two miles per day, taking them six days just to travel eight miles. Along the way, they discovered that some of their wagons would have to be abandoned and before long, morale began to sink and the pioneers began to adamantly blame Lansford Hastings. By the time they reached the shore, they also blamed James Reed. On August 25th, the caravan lost another member, one Luke Halloran, who died of consumption, near present-day Grantsville, Utah. About this time, fear began to set in as provisions were running low and time was against them. In the twenty-one days since reaching the Weber River they had moved just 36 miles. Five days later, on August 30th, the group began to cross the Great Salt Lake Desert, believing the trek would take only two days, according to Hastings. However, what they didn’t know was that the desert sand was moist and deep, where wagons quickly got bogged down, severely slowing their progress. On the third day in the desert, their water supply was nearly exhausted and some of Reed’s oxen ran away. When they finally reached the end of the grueling desert five days later on September 4th, the emigrants rested near the base of Pilot Peak for several days. On their eighty mile journey through the Salt Lake Desert, they had lost a total of thirty-two oxen; Reed was forced to abandon two of his wagons, and the Donners, as well as man named Louis Keseberg, lost one wagon each. On the far side of the desert, an inventory of food was taken and found to be less than adequate for the 600 mile trek still ahead. Ominously, snow powdered the mountain peaks that very night. They reached the Humboldt River on September 26th. Realizing that the difficult journey through the mountains and the desert had depleted their supplies, two of the young men traveling with the party, William McCutcheon and Charles Stanton, were sent ahead to Sutter’s Fort, California to bring back supplies. From September 10th through the 25th, the party followed the trail into Nevada around the Ruby Mountains, finally reaching the Humboldt River on September 26th. It was here that the “new” trail met up with Hasting’s original path. Having traveled an extra 125 miles through strenuous mountain terrain and dry desert, the disillusioned party’s resentment of Hastings, and ultimately, Reed, was increased tremendously. 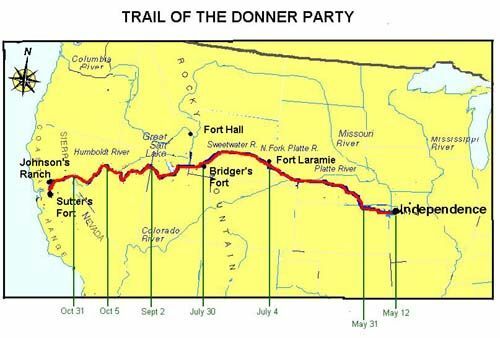 The Donner Party soon reached the junction with the California Trail, about seven miles west of present-day Elko, Nevada and spent the next two weeks traveling along the Humboldt River. As the disillusionment of the party increased, tempers began to flare in the group. It was an excellent read. The individual that wrote this story is a good writer. The dates and facts that followed were interesting and made me feel as though I was traveling with the Donor-Reed party. A sign of a good writer and well written. However, once again the author of this article infers the Donor-party resorted to cannibalism. Using words such as gruesome but never following through on a description of the circumstances only adds to the folklore and mystique of Donor Pass. Thanks to my grandmother, in the late 50s, earlier 60s, she purchased 224 acres of land in Elko, Nevada which the Hasting trail is included. I can proudly boast that we have a piece of history; the Donor-Reed party passed through and camped on our property. The property clearly depicts the hardship these pioneers endured. The historic dates and facts, along with the knowledge of what the property looks like in terms of elevation and winter conditions, clearly depicts the strength of these people. This is a part of history; if you are a descendant of the Donor party, be proud of your heritage. Remember, there is only speculation regarding cannibalism. To my knowledge there has never been substantial proof of cannibalism. I don’t believe any of us knows what we are capable of doing if put in the same situation and circumstances?